Leya Truelong has always lived socially and economically below other girls in her village but has always known that despite any advantage, her 14th year is the great equalizer. When the Mistress of the Sphere of Vision comes to town it’s not about what you have because your parents have bought it, it’s about what’s inside and what’s inside and Leya may the highest prize of all, the coveted double vision. Can Leya succeed over those trying to destroy her and overcome herself to become who she’s meant to be? The author, Bonnie Ferrante, gave me a copy of this novel in exchange for my review. Desiccate: Sphere of Vision Book One (Volume 1) is a novel that covers 12 years of the life of Leya Truelong from a brave but hesitant novice to a woman confident in her abilities. The journey is perhaps tedious at times and leaves rather gaping holes in time but pays off at the end in entertainment value and the sense of a character truly well developed and who has learned and grown from events the reader was able to witness. Additionally, the story is told from Leya’s point of view which gives us insight to the depth of her emotions as she leaves her family and encounters new experiences. Desiccate: Sphere of Vision Book One (Volume 1) is a character driven story. The setting is pretty generic for fantasy type novels. There’s a slightly medieval Narnia-ish feel to the setting. From the town on the banks of a river to the beaches blanketed in white sand, readers will find themselves relying on standards of the genre to set the stage. Beyond the general atmosphere, Ferrante builds something of a magical society ruled by the Sphere of Vision. There are points where this world seems perhaps bogged down in minutia. When it comes time for Leya to take her oath (Page 151), there seems to be some needless back and forth with the Mistress as to what elements her oath will include but the reader soon realizes that the minutia acts as a building block to the character. Over the course of the story, Leya grows from a novice caught up in teenage machinations to a woman having a baby of her own who she names Redemption. Abilities are dependent on eye color and like both her parents; Redemption’s eyes are two different colors hence providing the possibility of the coveted double vision passing to the next generation. The child’s father is not in her life (for reasons that would constitute a spoiler) and Leya uses the child as further impetus for change. Leya has gone from being sabotaged and bullied to a mistress of her own destiny and ready for new adventures. Desiccate: Sphere of Vision Book One (Volume 1) is about the journey. The action of the novel is not overdone and violence isn’t graphic. Ultimately Desiccate: Sphere of Vision Book One (Volume 1) failed to thrill me. It was good and very well written but not something that engaged me as a reader. I believe it was something of a victim of itself. Because of the vast time period covered there are things that pushed the boundaries of disbelief and also started to drag for the audience. Alex did not partner with me in this read as she is currently entrenched in another series but I believe that the level of involved emotion is on par with her beloved Chris D’Lacey and that she would enjoy this novel. If you have a child aged 12 – 110 who enjoys fantasy and finds the premise intriguing, give this novel a shot. I’d love to hear what you think. Bonnie Ferrante is the author of a number of books for children and adults. 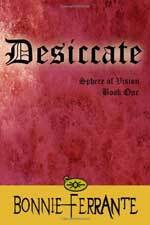 Desiccate: Sphere of Vision Book One is the first novel in the Sphere of Vision series. For more information about Bonnie Ferrante, visit her website and blog. You can connect with her on Goodreads, Facebook, YouTube, Pinterest and Twitter @BonnieFerrante.